With Memorial Day the end of May, then Flag Day on June 14th, and the 4th of July, flag & patriotic decor can be up for awhile, which I LOVE. Independence Day has long been my favorite holiday (next to Christmas), and I get so excited when I can start decorating. I made this darling burlap flag pillow for my front entry bench, and it’s perfect! It’s really easy to make, and I used the same method as my burlap flag bunting. I already had a burlap pillow cover that’s been sitting in my closet, but I would have made one otherwise. I actually need to make a couple for my boys’ beds, so hopefully I’ll be able to post a tutorial on those soon. 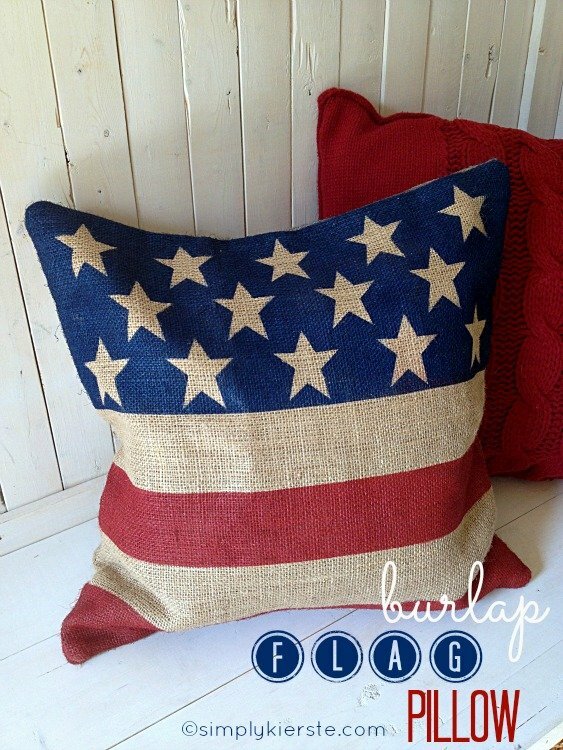 In addition to the pillow cover, all you need is just a couple of supplies, and you’ll have your own super cute burlap flag pillow! Before you start, insert a piece of cardboard inside your pillow, so the paint doesn’t soak through. If you can get a piece that’s just about as big to fit inside the pillow, it will also keep it spread out the pillow and keep it’s shape while you paint it. 1. I cut out vinyl stars with my Silhouette, but you could always try and find stickers the right size, which would also work. My burlap pillow cover is 20 x 20, and I cut my stars to be about 2.3 inches wide and 2.7 inches tall. I cut 14 of them—for two rows of five, and one row of four. I placed my vinyl stars on the pillow cover, keeping them on the top third. To make the stripes, I used painters’ tape, and layered two pieces to get the thickness I wanted. 2. You need to paint this in two stages–the stars, and then the stripes. I covered up the stripes with a board, so I could paint the stars and not get any blue paint on the bottom part. 3. Spray the top part navy blue (I used Rustoleum Navy), and let dry. 4. Once the blue is totally dry, move the board to the top, cover up the stars, then paint the stripes red. (I used Rustoleum Regal Red) Remove the board, and let dry. Pop in your pillow insert, and you’re done!!! Super easy, and SUPER cute!!! Oh I love this pillow. 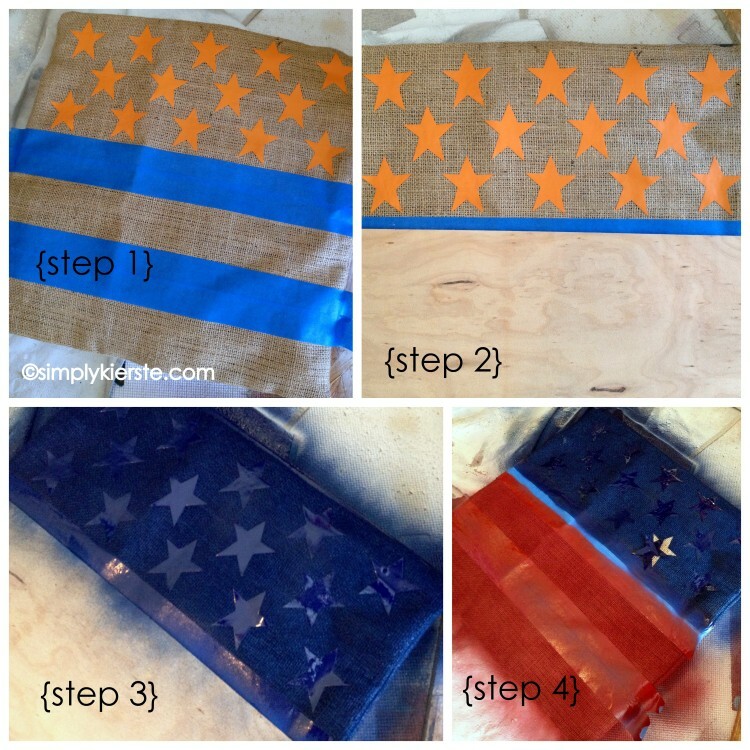 Easy to make and so patriotic! Thanks for sharing. Hi Kierste! Love your crafts as always! Do you mind telling me where you purchased your burlap pillow cover? I’ve never seen one. Love, love, love your blog and read it regularly. I have a notebook of projects, of which the majority is yours, to work on. We share the same taste in crafts and decor and I love the simpicity of your projects. AWESOME!!! I want to try to make the burlap pillow cover part myself, too. You know, do the whole thing from scratch. :) This is fantastic! Thanks for the inspiration!!! I received the new Pottery Barn Catalog today. I saw a similar pillow on the front for $49.50 and thought I could make one myself a lot cheaper. Then I come here and there is a tutorial. Thanks Kierste!!! Adorable! I love it and I can’t wait to make a couple! Kiersti! That is breath taking! Such creative people in this world. I love you all!! Oh, this pillow is darling, just as all of your projects are!! What talent!! Where do you find the time to always make such amazing things!!? I LOVE that pillow! Too, too cute! I love your pillow but I’m curious about how the fabric feels with the spray paint. Is it stiff? Does the paint crackle if the pillow gets smooshed? Thanks for sharing! I love this! Hopefully I’ll get around to making one for the bench on our front porch before the 4th of July. Thanks for sharing – I’m you’re newest Facebook & Pinterest follower! This is just the cutest thing!!! Love it. Really cute – found you on Pinterest! I will have to try this! Hi Kierste. I loved your pillow so much I had to make my own using what I had on hand. I hope you don’t mind that I share a photo of yours on my blog with a link to this post. You can see it here: http://cottonpickincute.blogspot.com/2013/07/the-easiest-diy-sewing-project-ever.html Thanks so much for posting your tutorial and inspiring me. I really do adore your pillow. WOW! How cute! What a great way to work with burlap. I can see using this method for several different themes. Thanks for sharing. I am going to use this method to make a valance for my son’s bedroom window. He just recently changed his bedding and he wanted a “flag” bed. This should work perfect as a valance. I just have to make sure I get all the measurements right! That’s a great idea!! You’ll have to let me know how they turn out!! I finished the valance but I don’t know how to post a picture for you. i love this but is it also machine washable? 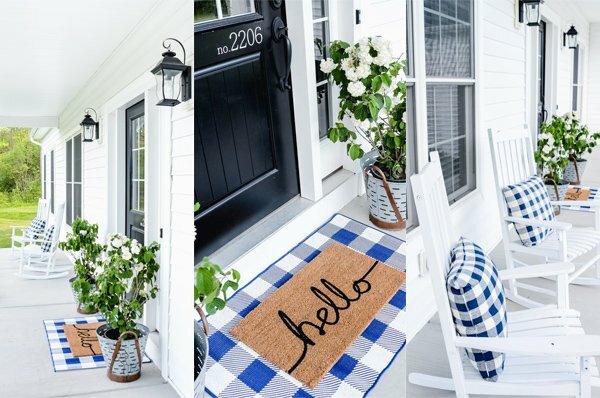 If you used fabric paint, you could try it. I’ve never washed burlap, so I’m not sure how it would turn out. If you do, let me know! Wow……this is amazing. Looking forward to making this. Thanks a lot for sharing this. Lovely project. You come up with great projects.